Add these restaurants to your travel itinerary, stat. Getting to Cuba used to be hard. But now you can fly nonstop to Havana, and when you'll land you'll face a different problem: figuring out where to eat. Fortunately, a local expert—none other than one of FIdel Castro's former private chefs, Ivan Justo—has revealed his comprehensive list of the best spots to eat in Havana. Here are Justo's Top 9 picks for restaurants you must visit when you're in the City of Columns, including his own outpost (natch). Opened in 2013, El Cocinero is located in the same complex as the hip and happening contemporary art space, La Fabrica del Arte Cubano (Cuban Art Factory), a former cooking oil factory at the edge of the Vedado neighborhood. The brainchild of Cuban afro-rock and hip hop musician X-Alfonso, the hopping bar/restaurant is accessed by a long spiral staircase that leads to a dining room and an outdoor roof space. Clientele is typically younger, more affluent and sophisticated, with expats and families also sprinkled in for good measure. It’s recommended that you call in advance since it is a popular place for locals. Once awarded “Best Paladar” (aka a privately-owned restaurant) in Central Havana, Casa Miglis was founded by Cuban-Swedish film director/music producer Michel Miglis and serves up cuisine meant to represent what contemporary Swedes have a hankering for, like Swedish meatballs and toast skagen, but takes full advantage of local fare in dishes like seafood casserole and tropical ceviche. Miglis has said that the intended vibe for his restaurant was that it would be a place to hang out all night long—starting with cocktails, segueing into dinner and chilling until well past bedtime. You might recognize this place from Conan O’Brien’s hilarious “vacation” romp episode of his late night talk show, which was filmed in Cuba in 2015. This paladar, open since 1996, is particularly well-known for hosting a slew of visiting celebs (including Natalie Portman, Beyonce, Jay-Z, Jack Nicholson and Helen Hunt), as well as for its location on the third floor of a very vintage mansion and tasty menu. Popular La Guarida menu items include the ceviche, eggplant caviar and honey-mustard chicken. Reservations are definitely recommended. This tapas bar, hidden away in a side street of Old Havana, masquerades as a dive bar, but serves up a hearty menu alongside its drinks (ranging from café con leche to, of course, cuba libres). Visitors to El Chanchullero recommend very affordable menu items including shrimp enchiladas and the chicken kebab. 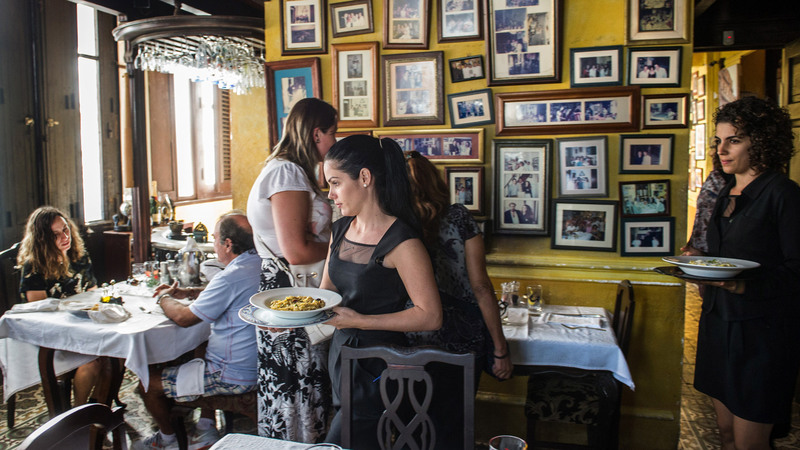 This legendary Old Havana restaurant dates back to 1817 and is famous for its daiquiris—as well as being Ernest Hemingway’s stomping ground when the author lived in Cuba in the 1930’s. Despite being a tourist trap, El Floridita fans say its worth a visit to sample the drink concoctions that won the restaurant kudos for being “the cradle of daiquiris” and to listen to live music in a historic setting. Housed in a high-ceilinged building in Old Havana, which dates back to the 1880s, Café de los Artistas (The Artists Cafe), serves both Cuban and international dishes. Considering that it's owned by the stage manager of the National Ballet, Luis Carlos, it's no surprise that the restaurant frequently plays host to a variety or artsy types. The gin and tonics and coffee artistry are frequently praised by visitors, as are ham and cheese croquettes and ropa vieja. Named for its street address, the Old Havana restaurant is said to be both simple and trendy, steadily patronized by a buzzy crowd throughout its opening hours. O'Reilly 304's ceviche gets top marks here—frequently being called out as a highlight menu item—amongst those who have eaten there, but the tacos, guac and empanadas also get high praise. Seeing how this is Justo’s list of where to eat, it would be suspicious if he didn’t toss his own restaurant into the mix. Fortunately, you don’t have to take his own word for how good the food is: TripAdvisor reviewers consistently rate Ivan Chef Justo as “excellent” or “very good,” with particular favorite dishes including the paella, octopus casserole, steak and baby pork as being particularly tasty. Justo also owns a more casual joint next door, Al Carbón, which features a highly-praised deep-fried suckling pig. Both restaurants are in demand, so calling a week in advance to make reservations is highly recommended. Another historic piece of Old Havana, this restaurant dates back to the Prohibition Era and was frequently visited by Americans seeking all the things they couldn’t get back home any longer, before morphing into a celebrity hotspot (Clark Gable, John Wayne and others often stopped by). Sloppy Joe’s closed down in 1965, after Castro took power and the American tourists stop coming, but reopened in 2013. No surprise that the Cuban sandwiches are popular, ditto mojitos made with 11-year-aged Santiago Rum.